Youth leadership is at the heart of Scouting, particularly with the 1st University Rover Crew. Led completely by the youth, the Crew of young men and women aged 18-26, has grown by 66.7%. 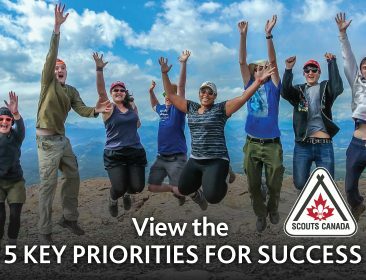 In a chat with Scouting Life, Rover Scout Grace Lee explains how the Crew offers a unique opportunity for international and local students at the University of Toronto, where the Crew is based, to get involved with Scouting. The success of the 1st University Rovers resulted from the use of different platforms to get the word out. Promoting Scouting through the university’s community outreach programs, club fairs and other university structures already in place, the Crew has also maintained an online presence as a simple and effective way to encourage interested students to connect with the Crew. However, the Crew’s promotion didn’t stop there. Despite their urban base, the Crew takes advantage of city living by attending events that are already happening in order to constantly recruit. They also organize unique public events, like a tour of Toronto Island followed by a campfire—complete with s’mores! To get encourage other potential Rovers to join, Grace also enlists a few clever recruitment tactics of her own, like leaving the door open while they hold their meetings so passers-by can poke their head in to see what the Crew is up to. The constant and enthusiastic recruitment strategies have proven successful, as the Crew continues to see growth. This year the Crew had the privilege of welcoming two new international Rovers, one from the United Kingdom and the other from France. These international Rovers have enjoyed the programming and have become a significant part of the Crew. According to Grace, Scouting has given them the chance to see Canada outside of the university, and they are very much enjoying their experience with the Crew. The 1st University Rovers are also active in the community, and partake in many great Scouting adventures. This year, they embarked on a winter camp in Burlington over the Reading Week break with another Rover Crew. The 1st University Rovers were also involved in a blood drive for a new local blood clinic that will be opening in their neighbourhood. Beyond the adventures that they share and their involvement within the community, the Crew is also active along the Canadian Path. Utilizing the Outdoor Adventure Skills guide, the Crew can share review sessions to track their progress in meeting challenges and developing a higher level of outdoor skills. They always apply the Plan-Do-Review method to all activities and events. Another way the Crew follows the Canadian Path is that every Rover must fill out a Personal Progression Plan, which is a list of personal goals that they would like to achieve within the Scouting year. Grace and her advisors work together with the Rovers to offer personal and professional development opportunities based on these plans. University can be a big place, especially in an urban metropolis like Toronto—but for the 1st University Rovers, friendship and adventure are never far.